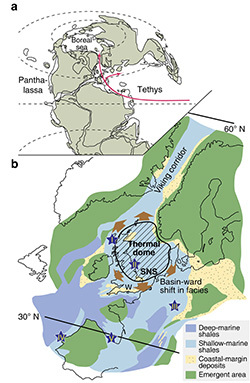 Figure 1: Late Early Jurassic palaeogeography, from Jurassic climate mode governed by ocean gateway, by Christoph Korte, Stephen P. Hesselbo, Clemens V. Ullmann, Gerd Dietl, Micha Ruhl, Günter Schweigert, and Nicolas Thibault, Nature Communications Volume: 6, Article number: 10015, DOI:10.1038/ncomms10015, licensed under a Creative Commons Attribution 4.0 International License. Christoph Korte is the main author of an article that presents these results published in Nature Communications on 11 December 2015. You can access the article on the Nature Communications website: Jurassic climate mode governed by ocean gateway by Christoph Korte, Stephen P. Hesselbo, Clemens V. Ullmann, Gerd Dietl, Micha Ruhl, Günter Schweigert, and Nicolas Thibault.